Unmanned aerial vehicle (UAV) start-up company, Helico, has introduced AirDog, the world's first automated drone designed to track and video outdoor sports and activities, using Stratasys' 3D printing technology. AirDog is a‘quad-copter' that operates via a wrist-worn tracking device and accommodates a standard GoPro sports camera. Users can automatically capture exciting live aerial video footage and still photography of themselves, having set distance, speed and height levels for AirDog to follow. Helico is specifically targeting the outdoor ‘extreme' sports market and expects AirDog to be of particular interest to recreational participants of freestyle BMX, motocross and skateboarding, as well as water-sports such as surfing, kite-surfing and wake-boarding. "AirDog not only grants end-users their own affordable and personal aerial video crew, but goes one step further in providing thrilling footage from distances and angles previously inaccessible to such consumers," explains Edgars Rozentals, Co-founder and CEO of the Latvia-based, Helico Aerospace Industries. Prior to investigating the use of 3D printed parts, Rozentals was trying silicon-moulded designs through a supplier in China. However, not only did this entail a two-week turnaround time, but the resulting models proved to be too heavy for take-off and were ultimately scrapped. "The benefits delivered by 3D printing compared to the method we trialled originally are numerous", says Rozentals. "Above all, turnaround time is significantly reduced and if we need to make last minute changes to a design, we can do so within a matter of hours, easily and cost-effectively. This was simply unachievable before as it necessitated time-consuming production of a costly new mould. "In fact, I'm not sure how we would have arrived at the stage of having a functional part, were it not for Stratasys 3D printing technology. I founded the company two years ago and we're a staff of three, so for start-ups like Helico, this technology isn't just a game-changer, but the ticket to the game itself," he explains. According to Rozentals, AirDog might literally have not got off the ground, had it not been for the instrumental role 3D printing played during the prototyping phase. The company sought the expertise of Stratasys' Latvian partner, Baltic3D, who also worked with Polish reseller Bibus Menos to meet the requirements outlined by Helico's team. 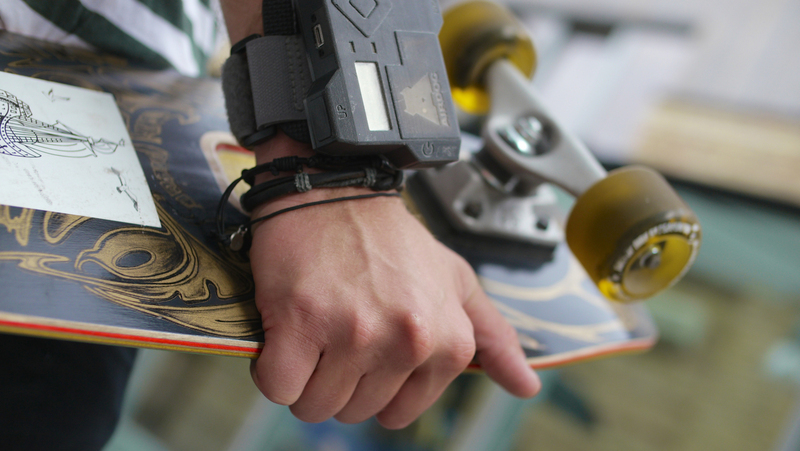 In order to produce fully-functional parts that could perform in the real environment, both Stratasys' FDM and PolyJet 3D printing technologies were employed for AirDog and its AirLeash tracking device, respectively. 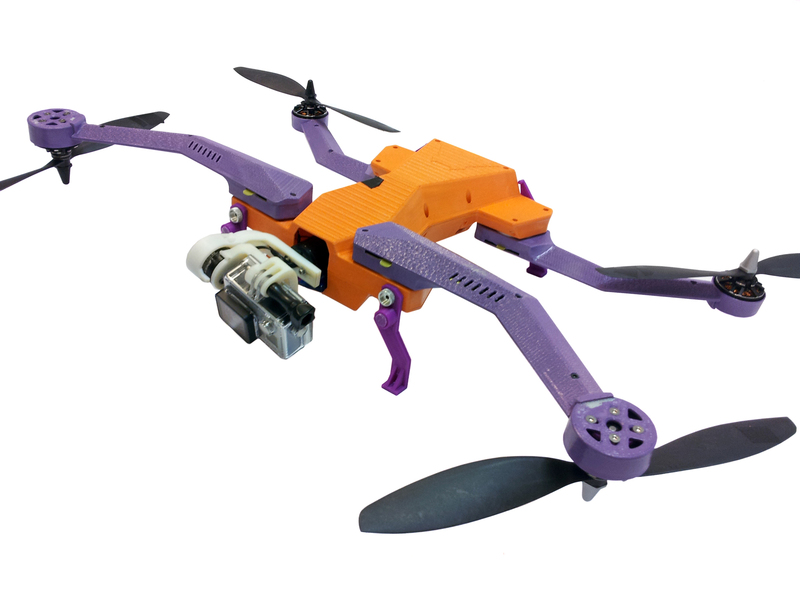 The final AirDog drone was fully 3D printed using Stratasys' FDM-based ULTEM material, chosen thanks to its ability to provide parts of extreme strength and durability, with the lightweight characteristics vital for take-off and in-flight manoeuvrability. "We were particularly impressed by how far we could push the boundaries of the ULTEM material," adds Rozentals. "The material's functional stability enabled us to print very thin walls that further reduced AirDog's overall weight." Conversely, the accompanying AirLeash was developed using Stratasys' PolyJet multi-material 3D printing technology. 3D printed in a single pass, the wrist-worn device combines rigid and rubber-like materials to produce everything from the robust housing case to the soft buttons on the keypad. "Airdog is a perfect example of how 3D printing is an enabler for inventors looking to turn their ideas into fully-operational parts quickly and effectively," says Andy Middleton, Senior Vice President and General Manager EMEA at Stratasys. "In this case, both our core 3D printing technologies have proved instrumental in producing a fully-functional drone and wrist device. With the exception of the advanced sensor technology, both parts have been created entirely using 3D printing." A Stratasys 3D printed version of AirDog will preview this month, as Helico executives begin a month-long promotional roadshow in the US to generate interest among end-users within the extreme sports scene. If successful, and pending contractual agreements with relevant manufacturers, Helico expects to commercially introduce AirDog to the market at the end of October, 2014.